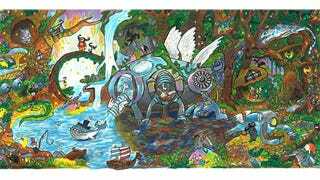 Today's Google Doodle, an animated, detailed illustration of some kind of imaginary water world, was designed by 11-year-old Audrey Zhang, who was awarded a $30,000 college scholarship after winning the Doodle 4 Google competition. This was the seventh annual Doodle 4 Google, a contest which asks students from kindergarten to 12th grade to design an invention that would make the world a better place (with the company's logo worked into the design, naturally). Zhang's winning illustration—titled "Back to Mother Nature"—was selected from more than 100,000 submissions. So apparently the inventions were more about the aesthetics than the logistics, and fantasy over function, but that's fine. It's not like it's a patent application. Along with a $30,000 scholarship, Zhang also scored a $50,000 Google for Education technology grant for her school and a $20,000 donation for charity:water.